Hello Friends! 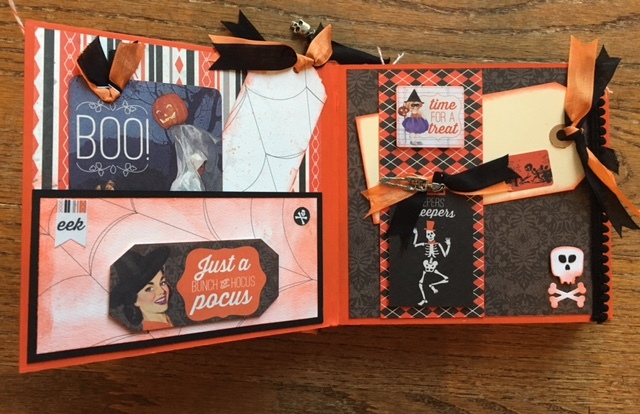 Daniela here on the Authentique Blog sharing with you a great Halloween Mini Album! How much do we all LOVE Bewitched!? I think I say this on every line I get to play with, but its one of my most favorite lines by Authentique! The wonderful vintage graphics, tongue in cheek sayings and beautiful patterns on all the papers, I just want to make everything with it. 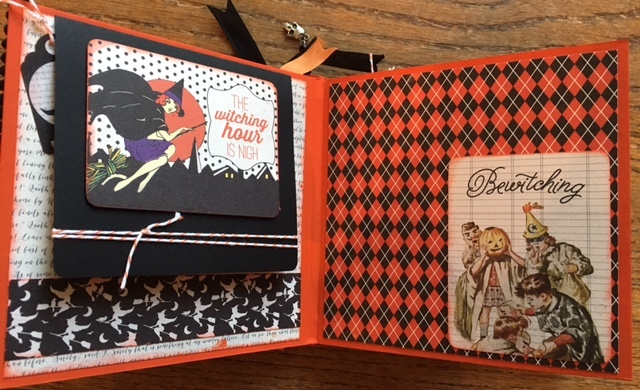 This is my Bewitched Mini Album! 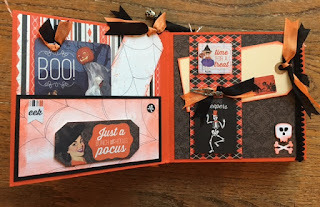 Featuring a Prima Marketing Mini Album, this mini has lots of room to add photos, journaling etc. For my cover, I've layered a few of the papers from the collection along with die cuts from Tim Holtz. The cutout I chose is near and dear to me as I have a TShirt with the exact saying, "you say witch like it's a bad thing". I love to make my own embellishments as well to add to my projects. 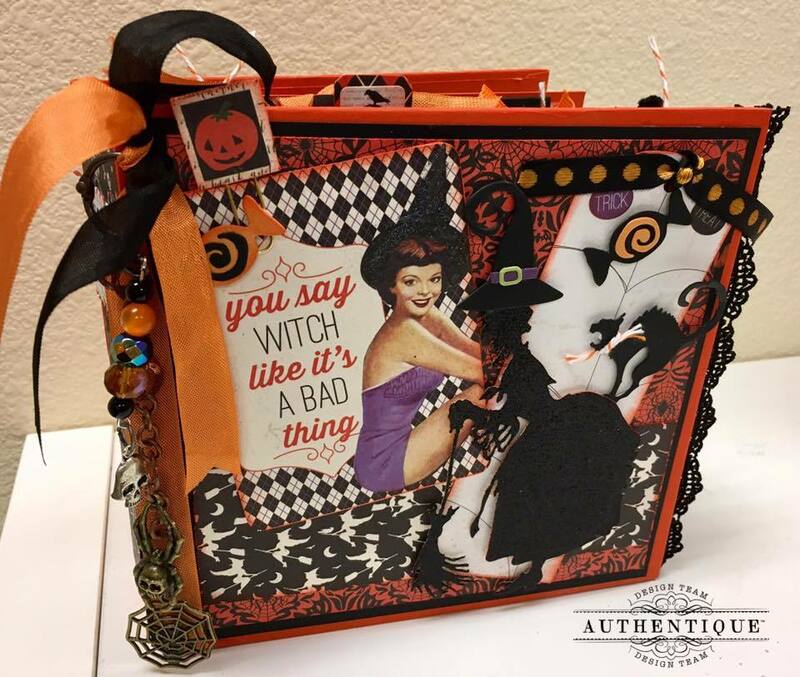 For this one, I made super cute paper clips with the papers and sticker sheet from the Bewitched collection. The little pumpkin on the square background is a mini paper clip! Super easy to make and so useful as well! I also love to make charms to hang on the sides of my albums. Using beads and charms I made the hanging charm on the side of the album. I made a mini tag from the spider web paper as well for the front. 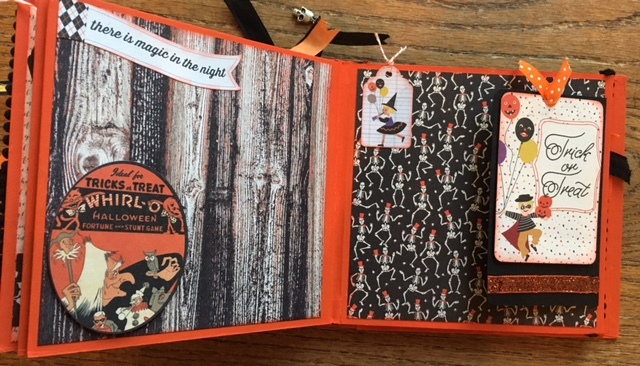 Using all the papers and sticker sheet, I've made each page of this album with a pocket, flap or other interesting element to the album. I love making pockets and things to hold tags too! 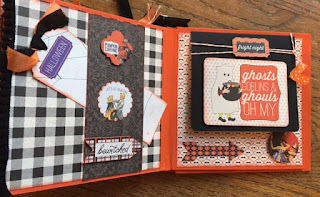 Below is a pocket page and a tag page. For the right side of this page, I've made a great placeholder for a tag. Using only adhesive on the top and the bottom of the strip, I can tuck cutouts, tags and photos in this place. 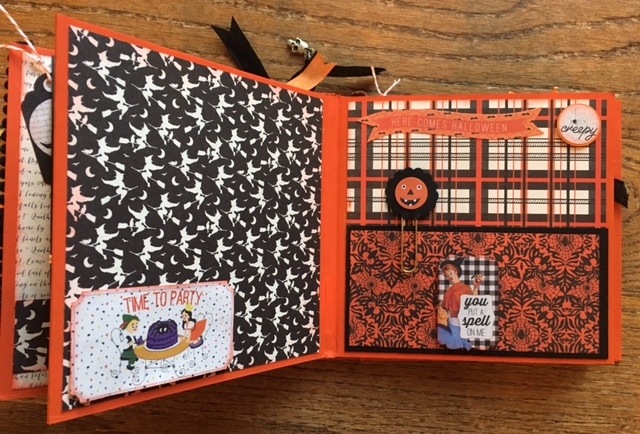 I also love to use the sticker sheet and decorate everything! I just LOVE the dancing skeleton tag, which I added ribbon and a cute skeleton charm to and adhered to the page. This nex page has a flap up, which features a cutout and then a place for a photo underneath. The page on the right is meant for a photo. I also placed a cutout on it but only put adhesive on three sides so that I can easily lift up the left side of the cutout to place my photo underneath. Here's another page which I've placed a sticker along the bottom and on the right side of the book, a pocket page. Can you see the little pumpkin face? That is another paper clip I made. 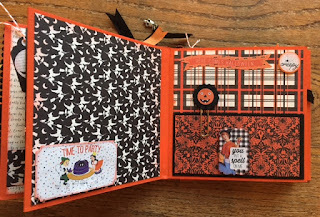 This time, I took a paper punch that was a one inch scallop and then placed the pumpkin face from the sticker sheet to pull it all together. This is definitely my favorite clip! The great thing about the Authentique paper is that is all goes together just beautifully, along with the sticker sheet. That sheet is such an easy way to add darling bits and baubles to your project. I often ink the edges and then pop them up with pop foam on all surfaces. I also love to staple little bits of ribbon to them as well. This page layout also features another strip that only has adhesive on the top and bottom so I can tuck in tags I've made from the paper, or photos or both! The strip is also the perfect place to use those fantastic stickers! I've inked and then popped them up as well. The right side is a flip up and features a great place to hide photos underneath. The album I used is a Prima Marketing album and I've painted it with the Dyan Reaveley, Dylusions paint in Tangerine Dream. It matches the Bewitched collection perfectly. I hope you've enjoyed seeing a portion of my Bewitched album. I can't wait to see yours! Have a great day and hope to see you again soon here on the Blog! This is such a great album, Daniela! I love to see what you come up with.